This straight stair lift to the Basement in Aurora, CO is designed to fit within 2 inches of the wall with no exposed gear. 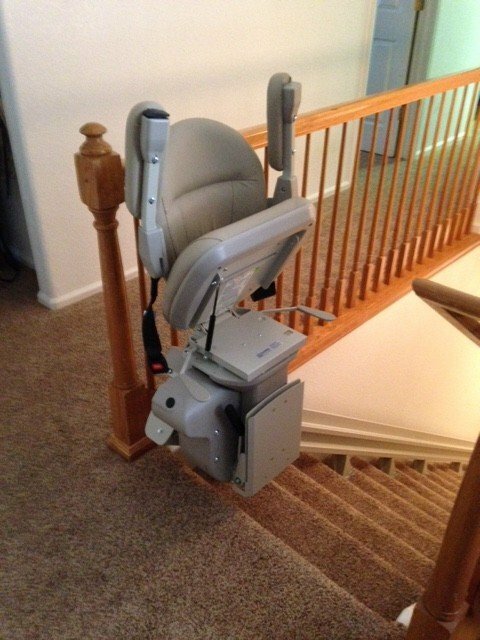 This stair lift helped the family enjoy the laundry and the media room in the basement. The chair is designed to fold up and away so that there is lots of room on the stairs for the rest of the family. It has on board batteries so that the stair lift will continue to operate even if the power goes out. It can charge anywhere on the stair case, so this stair lift will never run out of power. I wanted to compliment Jesse and you for your fabulous job in getting this put in for me. It is wonderful, and I use it all the time! It is so comfortable as well as nice looking, so it is a great addition to our home. We're so glad that we got the 'powdered paint' rails, as they blend in with the wall and carpet colors, to the point that you don't even really notice that they are installed. Thank you again for such a wonderful experience that your company has given me with regards to the Bruno Stair lift in Aurora.